In a press statement, Quikr said that the acquisition would strengthen its online realty play and augment QuikrHomes, the company's recently launched real estate vertical. 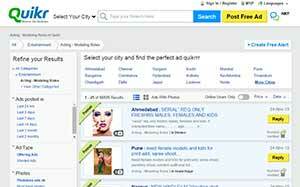 Quikr claims that with 200,000 transactions, its real estate business has doubled in the last three years. Founded earlier this year by Vikram Dhawan and Karan Jindal, IRX connects agents with end-users and other agents in real time. It's a chat platform that enables real time tagging of agents with projects and locations. Industry watchers say several once high-flying real-estate startups â€“ faced with deep-pocketed global players backing their rivals â€“ are considering mergers at the behest of their investors.